Although Krishna is very far away in His own abode, Goloka, He is also very near as the paramatma (Supersoul) in everyone’s heart. 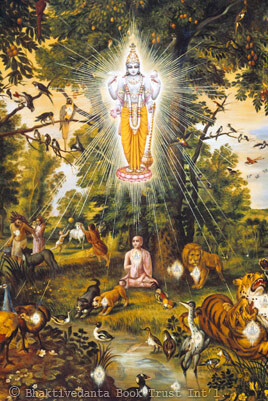 The Supersoul expansion of Krishna is the friendly companion who accompanies us in whatever material body we get. He witnesses our thoughts and actions. Responding to our desires, he provides us various types of intelligence. He gives us both memory and forgetfulness. We souls cannot do anything without the Supersoul’s sanction. He helps us stay in this world if that's our wish. And when we decide to respond to His call, He will help us develop love for Him and leave this world for good.